Dreamy they are!! Add toffee to the mix and they get dreamier!! While you all know I love to bake, for some reason, my pecan pies never turn out, but these babies, well, that's a different story! These scrumptious bars turn out perfect and are gobbled up in no time. Plus, what I like about them is they are not real sticky like pecan pie can be. 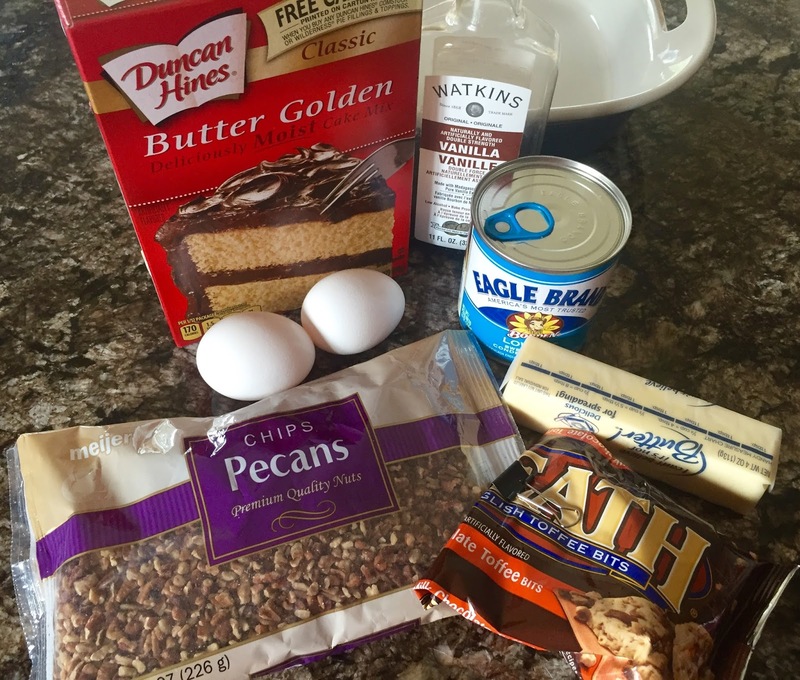 I don't bake or cook much with box mixes but the convenience of this recipe cannot be beat! Perfect for a potlucks, gifts or after Sunday dinner treats, you will love these. Instead of chopped pecans, I like to use pecan chips, just makes a nicer topping and bar texture but if you like it chunkier, you could use chopped ones. Preheat oven to 350 degrees. Combine the cake mix, one egg and butter and combine with a fork until crumbly. Press into greased 9x13 pan. Mix condensed milk, egg and vanilla until well blended. Add in toffee and pecans and pour over crust. Bake for about 30 minutes or until edges are becoming browned. Middle will seem a little jiggly but don't over bake. Cool completely and cut into bars. Happy Tasty Tuesday lovely people!! Have fun in the kitchen! These sound so good! I'm going to have to make them for our next get together! Oh my word, this sounds like pure heaven!! This is right up my alley and I think I could change some things up so I could eat it!!! LOVE! Those look fantastic! I need some right now! Oh my gosh, Andrea! I'm drooling! 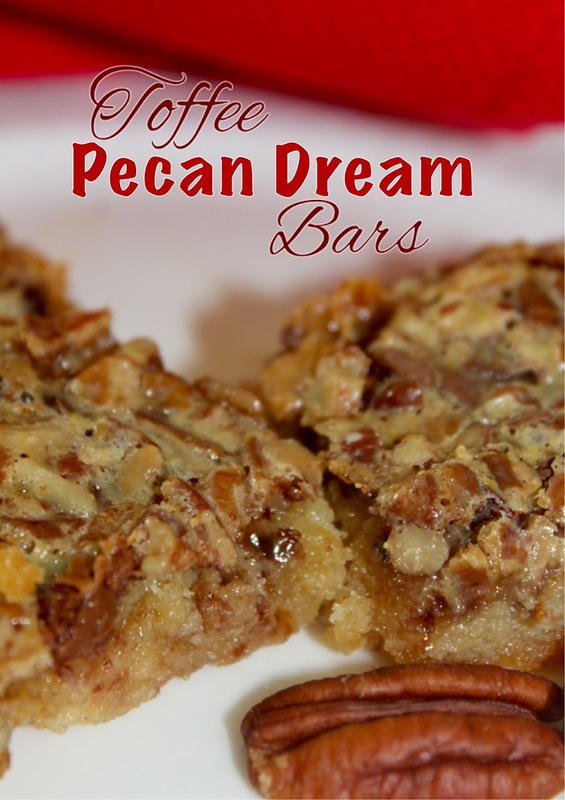 I love anything with pecans and these looks so gooey and delicious! I could go for one right now with my coffee! You had me at toffee. I freaking love toffee!!!!! Yum! I've just recently become obsessed with toffee, so this sounds like the perfect dessert to me! OMG! Super delicious, Andrea! I need to try this recipe! Lately I've been into discovering new recipes -- and I'm adding this one to the list!! They do sound like a dream! 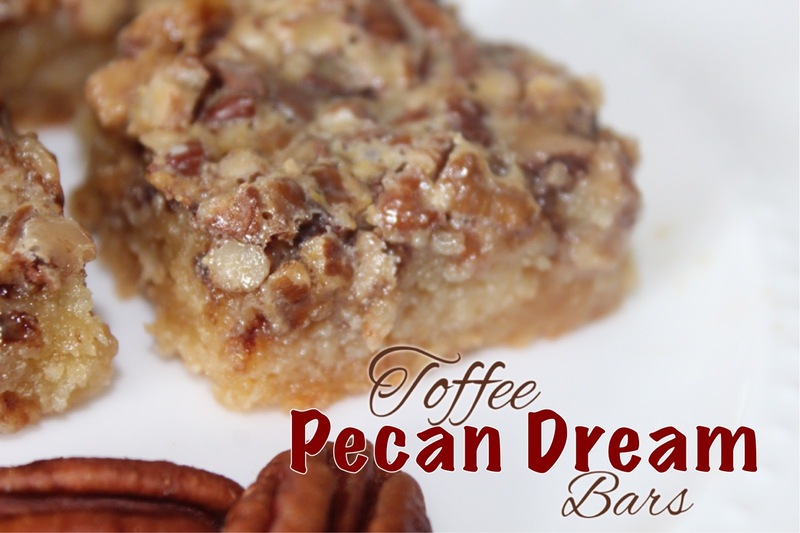 I love toffee and pecans! Yummy! You share the best recipes! My stomach is rumbling now! These sound amazing! You always have the best recipes, these look delicious! I should make these for my son, he LOVES anything with toffee. Ooooh boy! These sound good and certainly easy enough. My husband doesn't like nuts, so I'd have the whole thing to myself!! (or I suppose I could share with others.) That meme at the end is hilarious! Ooooooohhh this could be dangerous for me...LOVE toffee! Toffee?!? You are a genius! Thanks so much for sharing a Southern favorite at Waiting on...Wednesday! I'm literally drooling now-haha ;) Looks delicious! Dang this 21 Day Fix business. I am hungry, well, not really but I want to EAT! 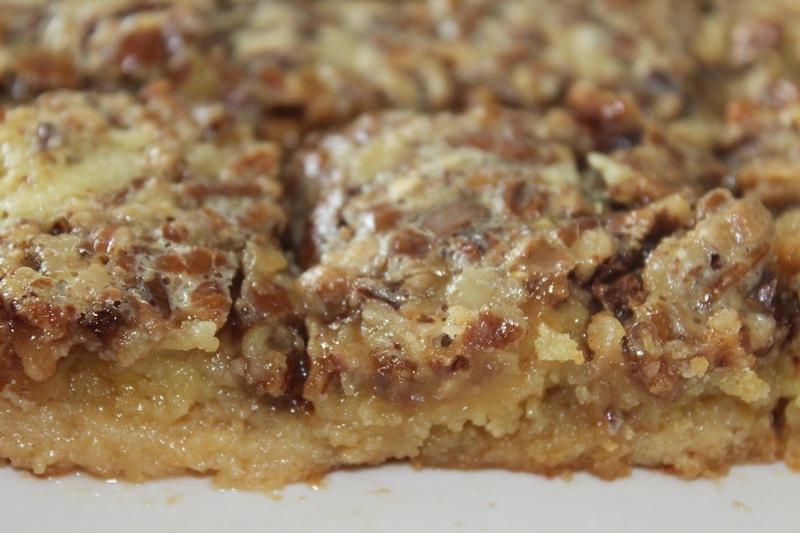 And eat one of these toffee pecan dream bars with a nice cup of coffee. Mmmm. 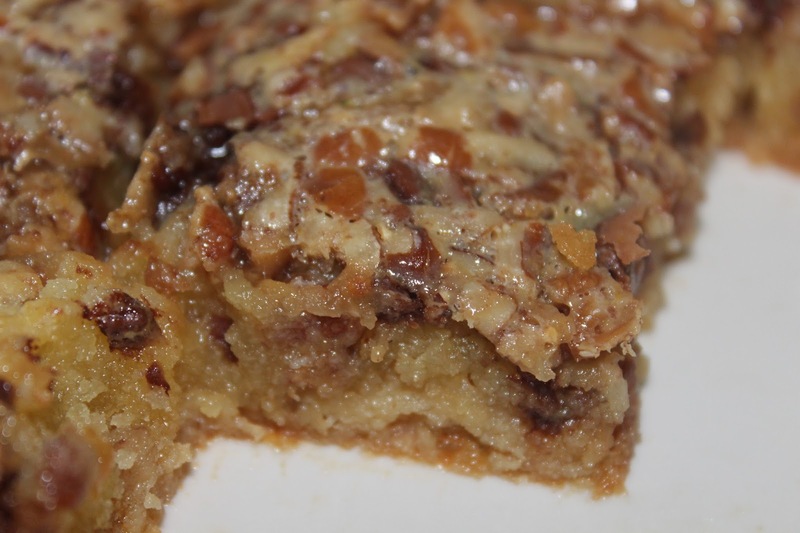 This recipe has been properly pinned and repinned and will be in the lineup to replace the traditional pecan pie. Oh my- these sound delicious Andrea! This recipe sounds amazing! I never used to like desserts with nuts until finally trying pecan pie which was too good to be true so I know these bars have to be delicious! You not only dress stylishly, but you obviously can bake too! These dream bars look dreamy lish to me. Pinned this one, my dear--thanks! Ahh man this recipe is calling my name. I am a huge lover of toffee and pecans. This looks good and an easy recipe to follow! These look incredible! Pinning to share and to save! Thanks for sharing your recipe with us at Snickerdoodle Sunday! All my favorites! Pinned and shared. Thanks for sharing with us at Throwback Thursday! I love pecan pie, it's my favorite pie ever! This is what my family gets me for a birthday dessert! Love this much more than cake. 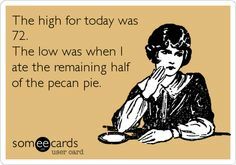 And yes, I have been known to eat almost all the pie myself! 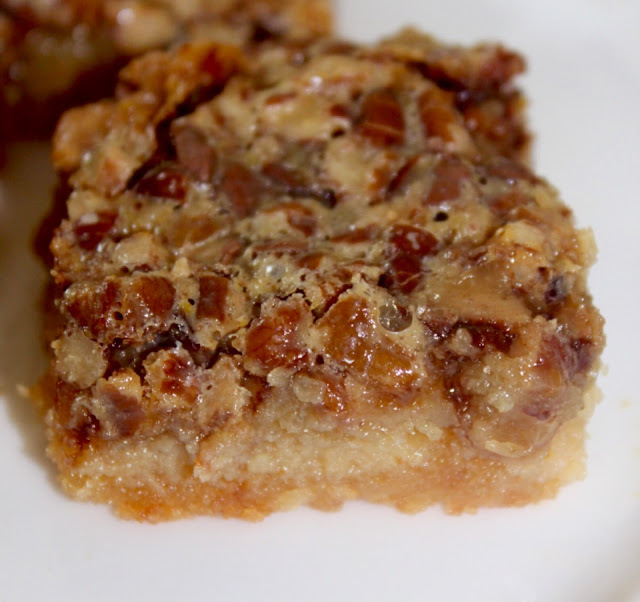 LOL So these bars are a "dream" for me, pinning and sharing, everyone needs this recipe! Oooey gooey sticky yumminess! Thanks for sharing with us at the Throwback Thursday Link party! Oh yeh! These would be a Dream Come True for me...I'm wild about pecan pie and these look out-of-this-world wonderful. Thanks so much for sharing with us at Weekend Potluck. Please come again soon. Yum, yum yum! They look like a holdable pecan pie! I love it!Thanks for sharing at You Link It, We Make It, we hope to see you back tomorrow. Pinning! Yummm....I can almost smell them. Thanks for sharing recipe. I so want to make these! They look delectable and pecan pie is my favorite!! Thanks for the wonderful share at Weekend Potluck, Andrea! We hope to see again this Friday with another delicious share! All you have to say is pecan and toffee. Plus, these look so soft and delicious. You had me at toffee! These look amazing! Pinned and saved to make ASAP! These look really delicious. Thanks for sharing the recipe at our Cooking and Crafting with J & J. We hope to see you agian. HOW WELL DO YOU KNOW YOUR MR.?